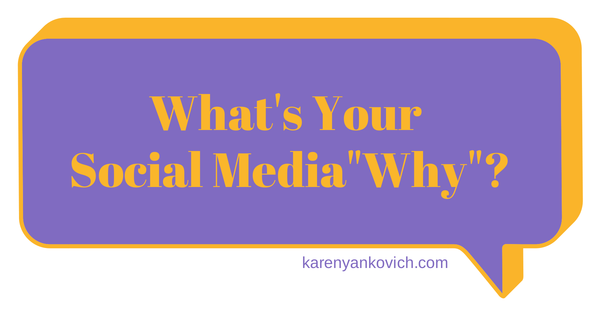 What’s Your Social Media “Why”? We all know and love Simon Sinek for his inspiration in today’s business leadership world. His book “Start With Why” revolutionized entrepreneurs and big business alike. Personally, it inspired me to dig deep into my own business belief system and I find myself using and teaching a lot of ideas he talks about in his book. If you haven’t heard of him or seen his Ted Talk, watch it here, now. You will not be disappointed, then come back to this post and dive in, because I believe there is a second layer of “What’s Your Why” that I would like to delve into here today. Many thanks to Simon as I piggyback on his foundation. What is your ultimate goal with each platform AND each post? Sound daunting? Don’t worry, I won’t let it be. Just like figuring out your business foundation you MUST set your social media foundational goals deep so the roots of your business marketing can reach far and wide. Set your social media goals deep so the roots of your business marketing can reach far and wide. Let’s get started. Read on as I address some common social media “whys” and what to do about them. Is your social media “why” – to build your list? Great! Social media is a fantastic way to do this. If that is your focus then beautiful meme’s are not going to be top of your social media to-do’s. Make sure there is a link to your opt-in in your Instagram, Twitter, and Facebook bio sections. Tweet 5 times per day with a URL that sends those who click only to a page on your website that is a squeeze page for your opt-in. Create a Facebook app that engages your followers to click and join. Is your social media “why” – to bring more traffic to your website? Perfect! Social media is a great vehicle to make this happen successfully and easily. If this is your focus then you wouldn’t want to post about your dog’s latest and greatest (though funny and cute, and definitely important in the right setting!) Nor would you want to focus on requesting LinkedIn recommendations. Add beautiful pins on Pinterest that showcase your products and services and point directly back to your main website. Tweet up to 22 times a day, linking to your blogs, your free resources, your services and products, even your testimonials! Publish or post on LinkedIn valuable content that shows you are an expert and links to your website blog, services, home page and more. Follow influencers on Twitter. Favorite, Retweet, and Repost their stuff. Engage with them and see what they have to say. Find out who runs the conference you would like to speak at. Follow them, engage and share their content once again. Connect with influencers and conference organizers on LinkedIn. Save details and use them in a personal IN-mail when you connect. Share their content in your groups and in your LinkedIn posts. Is your social media “why” – to find media outlets to build your portfolio? That’s great! I love this way to add and extend your reach, build more of your business foundation through expert status, and round out your website, bio and LinkedIn profile nicely. If this is your focus then posting about your latest blog is not going to get you noticed. Connect with those who send HARO requests and emails. HARO is “Help A Reporter Out” and is wonderful for collating a bunch of inquires across many subjects into one email sent directly to you. Hopefully you are signed up for this, if not click here and wait for the magic. These HARO requests come from a real person! Connect and engage with them on LinkedIn, introduce yourself and tell them you are available to comment on the current article they are requesting information on, or for future research. Follow online and print blogs, magazines, radio shows, etc, that you would like to be featured in. Follow them on multiple platforms to get a sense of their vibe, their tribe, and what they like to talk about. Engage and build a relationship with editors, contributors, anyone who is involved. Then offer your services as a guest blogger or interviewee for a great topic that fits their “why”, and then keep offering! Share and repost quality blogs that you love and occupy your business niche. Engage and comment to create a relationship with the author/creator. These might be your competitors in some respect, but there is plenty of money and clients to go around! The more you share and collaborate the more everyone wins. Ask to have them guest post on your website, and then offer to do the same for theirs. These social media why’s are not all the why’s you might have, and you probably will have all of them as a priority at varying stages of your business career. The important thing is to remember to ask yourself, what is your “why” right now? Do you have another social media why you would like help figuring out how to tackle? Lovely! Join my LinkedIn group and ask away! Myself and others in the group will give you a list of ideas to create your plan before you wake up the next morning to tackle a new day. Onward to your social media success!